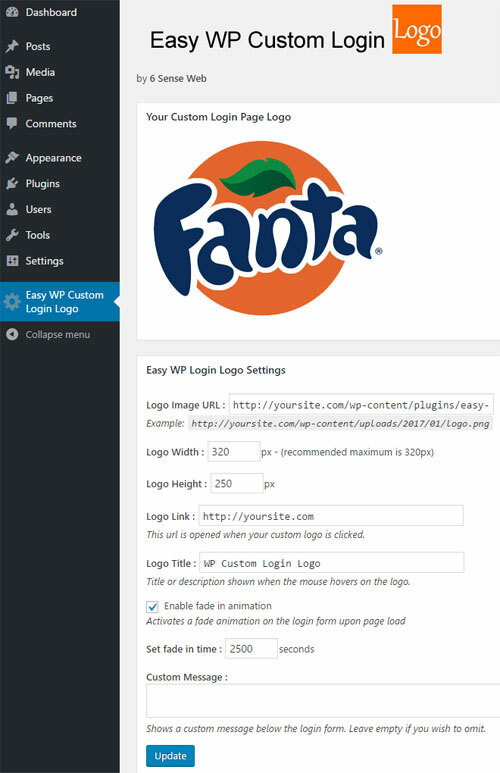 The WP Custom Login Logo plugin allows you to customize the admin login logo on any WordPress site. It is quick and easy to set up only taking a few moments to professionally brand your site with your own personalized logo. Only requires a URL to your logo image file. Easy to use settings page accessible directly from the WP admin menu. Set the exact dimensions of the logo file you want to display. Set the URL you want to open if a visitor clicks on your custom logo. Set the title/description of your custom logo that displays on mouse rollover. Activate/Deactivate a fade in transition on the login page load. Transparent images (eg.GIF & PNG) can also be used. Purchase the Easy WP Custom Login Logo plugin and professionally brand your website with your own personalized logo during sign in. Produce a professional looking login page quickly and easily using the Easy WP Custom Login Logo plugin.